What did you do this past weekend? This seemingly simple question can bring panic and frustration for many bisexual women of color in the workplace and at learning institutions. Although we all work at different types of jobs; be it as a librarian, farm worker, health care provider, retail cashier, bus driver, or a scientist we all spend 8 to 10 hours days at “ Don’t Ask Don’t Tell” repealed spaces; spaces where silence, neglect and isolation towards bisexuals are still part of the normative culture. Though many of these spaces claim to be LGBT welcoming or equal opportunity employers, we bisexual women of color often can not share with our co-workers, supervisors, or classmates about our bi community volunteer work, the online and offline support groups we lead, the genders of our partner(s), or the bi community event we went to this past weekend. This culture of silence adds to our depression, triggers our PTSD, impacts our workplace and school work performance and often lead us to suicidal thoughts and attempts. Bisexual women of color often can not get new jobs or change schools due to structural racism, sexism, cis sexism, biphobia, transphobia, poverty, immigration legal status, pension plans, disability, or lack of opportunities, yet we are not alone. We have safe Bisexual People of Color organizations* that offer online and in-person spaces that value bisexual women of color and where we can share our stories and receive support. As Bisexual Awareness Week 2015 comes to a close we want to bear witness to that the fact that many of us must be privately bisexual especially at work or school, at least for now, while we work together for a bi safer tomorrow. 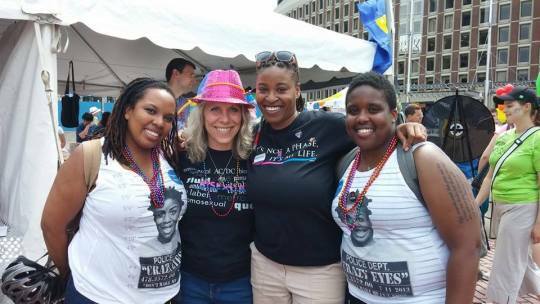 Celebrate Bisexuality Day – What Bi Visibility Means in the Workplace by Dr. Lauren Beach, J.D. Gwendolyn Fougy Henry, EdM, MSLIS, is the Founder and Director of Bisexual Women of Color – BIWOC, a community organization that provides emotional support, resources and community to bisexual trans and cis women and gender non-binary people of color in Boston, MA. USA and abroad. www.biwoc.org Gwendolyn is also the Co-Founder of Bisexual Librarians Networking Group (BiLNG), a professional support group for bisexuals in the library and information science field.